One of my basic items is a pair of Under Armour liner shorts, like these found here. They should be available in different inseam lengths. I have bought them at Academy or Sports Authority stores. Now, I am a stickler for, shall we say, derriere coverage. 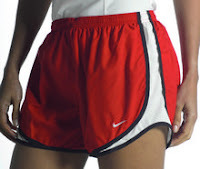 In that light, I wear a loose pair of nylon/Drifit running shorts over the liners. And black is my BFF. I have 2 faves, both from Nike. I wear the ones above almost all the time. Nope, this isn't me. My newest fave is a running skirt. You have the coolness and girly-ness of a skirt, plus the support and coverage of shorts underneath. The best of both worlds. Check them out here. I recently found them at Target also, and they were cheaper--which is always good. Target usually has a great assortment of running clothes by Champion, and the prices are reasonable too. You can see for yourself here. As for shirts, almost anything made of Coolmax or Drifit material, with a low to zero cotton content. Currently, I like the v-neck from Nike. I know it goes against everything we've ever heard, but cotton is NOT your friend when you exercise. It gets soggy and can cause chafing or blisters. Eek! Remember this also when you choose socks. Shoes are a personal preference. One bit of very important advice though, make time to visit your local running store to be properly analyzed and fitted for your shoes. Even if you buy them somewhere else, know what type works best for your foot. These babies are going to be taking a lot of pounding. It's the most important purchase you make for your running hobby/addiction. Personally, I love Mizuno Wave Creation. You can read more about them here. If you ever have a problem with chafing or blisters try this, or good old Vaseline. Hydration is critical on longer runs. It's personal preference, but you need a plan. I use this. Maybe a sport watch, an MP3 player, and energy gels/blocks and you're ready to go. That's about it for now, folks. Happy running! Happy walking! Just get your feet on the street! Do you have a must have for running? awesome advice. i love body glide. it lasts forever, too- great for ipod chaffing. i have too many musts. first, must have ipod- the nano is my friend. have to have sunglasses if it's sunny. if i go over 75-90 minutes, i carry a chopped up powerbar and have a piece of that every 30 minutes after the hour. definitely looking for a fuel belt. last time round i stashed bottles or had my husband bike them to me- that kind of ended when he forgot to get up early enough and i was dying for water at mile 10.
i've never tried the liner shorts- i might have to check those out! my shoe is the brooks addiction. have to get it from the runner's sole in spokane- nowhere else. i also have to make sure my foot is still good in those, so i try on a ton of pairs. Very good info - love the running skirts. I'm going to have to pick up a couple for my big 26.2 this October. Very, very cute! Good info. I too wear the Mizuno Waves. Earlier this year I was training for my first ever half marathon. I was NEVER a runner, but found that I loved the running and the training. Unfortunately, I got a stress fracture in my tibia 6 weeks into training. I was so bummed. I did not get to run the race. It has been a slow recovery. The Dr. still doesn't want me running on concrete. Hopefully it will all come back soon. I am going to go look at those running skirts tomorrow. I bet they would be great for golf as well. Take care! I love to run...now remind me I said that on Sat. mornins at 6 AM. Ok- I want a skirt! Maybe that can be my reward for running my first 1/2 Marathon in Nov.! Now what is body glide?? Thank you a million times over for this post! i was so hoping for it. i did buy a jug of vasoline the other day. unfortuantely i am pushing a double jogger so that serves as the carrier for any hydration. i am looking for the perfect shorts right now and am a bit frusterated so thanks for your tips. but i must say Hind is my favorite brand of anything i buy - it seems to serve me well. i am very picky about my socks too. i just got some new smart wool at REI and love them. then there is this brand I get at fleet feet i can't remember the brand but they are like wearing butter! thanks again i will keep checking back to see what are some other favs! i am tempted to wear that skirt and think it is a cool idea, but afraid i may look dorky! don't know if i am cool enough to pull that off! I like Gu energy gels. My fave. is the espresso love flavor. I also like Clif Shot Blocks. They are big gummy squares, not as messy as Gu. I also like Clif Protein bars, like 1/2 before and the rest after. I got a running skort last summer, w/ a matching tank. it is my swim suit! I stumbled upon your blog and thought I'd add my two cents. In addition to the fuel belt, body glide, mp3 player and clif bars you mention in your post (and comments) I can't run without gum and chapstick. As a matter of fact, last week I was heading out on my run when i realized I didn't have either of those things. You better believe I went back to my car to get some!! And here I am again...I have two running skirts that I like, but one has briefs...and my thighs and briefs don't get along so well...the other has shorts, but they are super lose and end up being briefs (I mean, they aren't blowing in the wind or anything, but they are not compression shorts as I was led to believe). 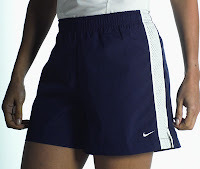 How do you like the shorts on the sportskirts?